Under current legislation, admission to our nursing home must be through a Community Care Access Centre (CCAC) (1-888-721-2222). The Placement Coordination Service (PCS) works within the CCAC. Individuals need to meet their criteria for long term care placement. If you are considering our Home for your loved one, we would be pleased to arrange a tour of our nursing home, and assist you with any placement requirements or concerns. We will try to provide the accommodation that has been requested. However, because of our high bed occupancy we are not always able to do this immediately. The resident will be transferred to their choice of accommodation as soon as it becomes available. Responsibility for uninsured services, where authorized. The Admission Agreement must be signed on the day of admission and then annually thereafter. Payment for accommodation is the first of each month. Personal clothing and effects should be provided, as needed or desired. Responsibility for hospital charges and costs for transportation to hospital, if required. Responsibility for payment of physician’s fees, medications and other treatments or aids ordered by the physician and not covered by existing benefit programs. 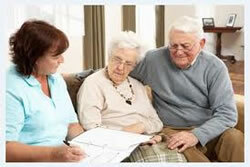 The Nursing Home has an Admission Agreement for each resident that outlines who is responsible for financial matters. Please be sure to review the information in the Admission Agreement with the individual who is processing your admission. This will ensure we have the correct contact name(s)and number(s) of whom should be contacted in case of an emergency or a change in resident status.